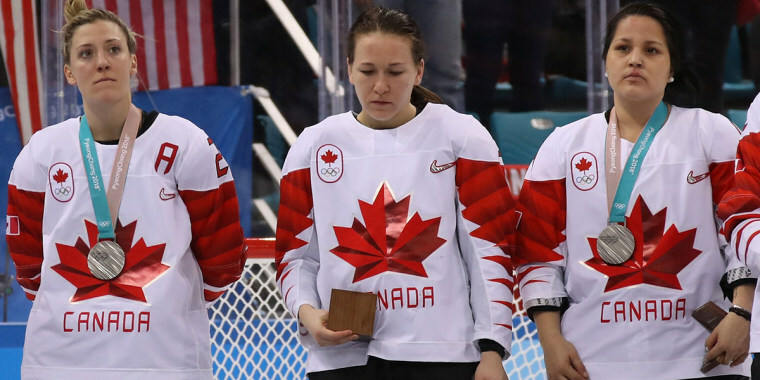 Canadian Jocelyne Larocque has apologized for immediately removing her silver medal after it was placed around her neck during the women's hockey medal ceremony. Canadian hockey player Jocelyne Larocque has apologized for quickly slipping off her silver medal on the podium following a crushing loss to rival Team USA on Thursday. "In the moment, I was disappointed with the outcome of the game, and my emotions got the better of me," Larocque said in a statement through Team Canada on Friday. "I meant no disrespect. It has been an honor to represent my country and win a medal for Canada." "Please understand this was a moment in time that I truly wish I could take back," she added. The Team Canada defenseman's move drew polarizing reactions, with some saying she was showing poor sportsmanship. Others chalked it up to her competitive fire. Canada, who won gold at the four previous Olympics, lost to Team USA 3-2 in a thrilling shootout. Larocque, who was part of the gold medal-winning team in 2014, was the only Canadian player who refused to wear the silver medal during the ceremony, and she kept it off for about a half hour afterward, according to reports. Eventually, an Olympic hockey official told her wearing it was mandatory, according to The Globe and Mail. In her statement, Larocque, who was an all american at the University of Minnesota-Duluth, said she regretted setting a poor example for young female hockey players. “I take seriously being a role model to young girls and representing our country," she said. "My actions did not demonstrate the values our team, myself and my family live and for that I am truly sorry." Some of Larocque's opponents empathized with her disappointment. "I definitely understand it," U.S. coach Robb Stauber told reporters after the game. "It's a very heated rivalry." "She is very remorseful and takes responsibility for her error," Team Canada general manager Melody Davidson told The Associated Press. "Emotions run high at the Olympic Games, and never more so than in a gold-medal game, but at all times we expect our program to act professionally and demonstrate sound sportsmanship."